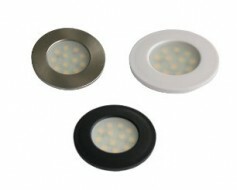 This Colour changing RGB LED Puck Light is storked in a Brushed Nickel housing or can be recess installed with a Black, White or Brushed Nickel Trim Finish. Requires RGB Controller. Please see our Accessories Page. 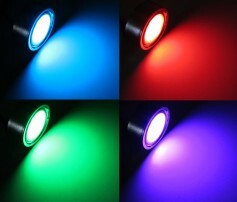 Color Changing RGB LED Puck light that can be recessed or surface mounted. The Rd07-RGB LED light includes a surface mount bezel and recessable LED light engine that has 12 Colour Changing RGB LEDs with a frosted lens. Requires RGB colour changing controller.